Register Log In Vannin' Community and Forums Forums Electronics Smacked a deer. Now, no high beams. Hey ladies and fellers! I hit a deer pretty good a few weeks ago. I'm slowly collecting parts to get it looking good like it used to again, but my high beams don't work any more. The bulbs are both good, but they don't come on, nor does the high beam indicator on the dash. I've looked through my chilton's manual but can't find a fuse for the headlights or find where a relay might be. Let me hear your brilliant ideas for how to get this working again! (3) wiring for the high beams. Year, make, model, and photos of damage might help. What Reed said and maybe pics would help. 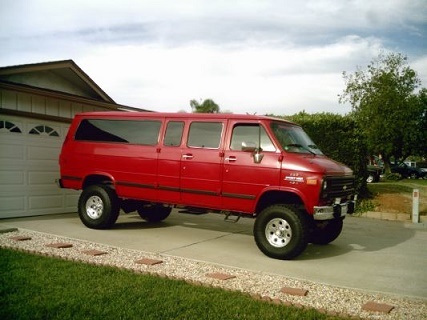 1990 Chevy G20. I'll try to get some pics tomorrow. Dimmer switch: It turns the low beams on, I'll run out and check that is dims the dash lights tonight. Ground: Both from the battery are good. The one that connects to the body close to the battery is fine, and I used half a can of brake clean on the one that connects to the engine block to clean it while I was checking down there. Wiring for the high beams: looks fine under the hood. Nothing broken, pinched, etc. All other lights work before the fuses blow. The dimmer switch turns off the dash lights after the detent. More of an off/on than on/dim/off..
That is normal for dirty contacts on the dash dimmer switch. What about the high/low beam selector switch? That is what I was referring to when I said "dimmer switch" above. I wasn't referring to the dash light dimmer switch. Oh gotcha. ;) Or maybe the 'brighter' switch? I had to adjust the steering wheel down a bit to get it to work lately, but it worked. Damage isn't so bad but has prompted me to start a few projects with the ol' girl.